The Leone Premium is composed of the two interconnecting apartments Leonina and Leonessa (see links below). 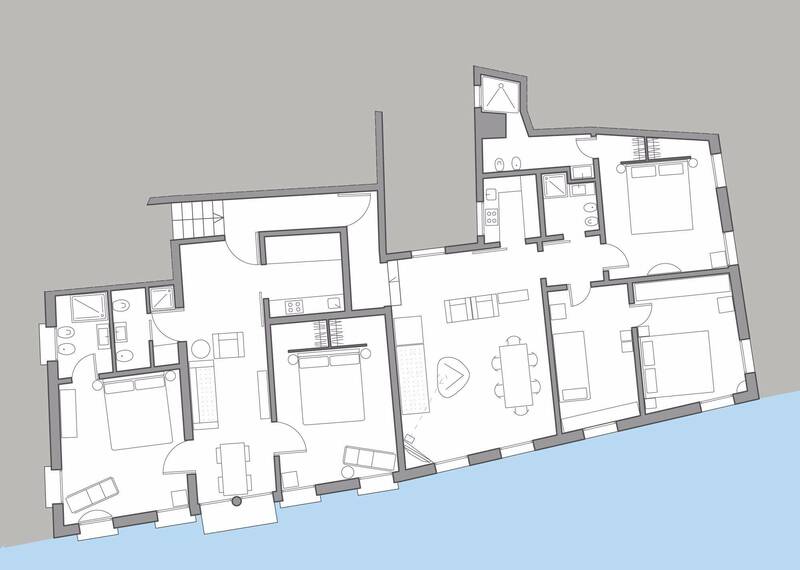 Strategically located in the center of the beautiful Dorsoduro District, this is probably one of the most fascinating contemporary 4 bedrooms apartment you can find in Venice. It is found next to the charming Campo San Barnaba, is accessible in only 2 minutes walk from the Cà Rezzonico Vaporetto stop and about 4 minutes walk from the Accademia Bridge. In the surroundings you can find the Cà Rezzonico Museum, the Peggy Guggenheim Collection, Punta della Dogana and François Pinault Foundation, the Accademia Galleries and other world famous landmarks. Many Venice connoisseurs and influent artists bought their house here as it is a picturesque, quiet and central area of Venice. There is a laptop with Wi-Fi internet connection at the apartment and there is a laundry on the ground floor. Every room is air-conditioned and the temperature can be adjusted individually. The structure of the house grants maximum privacy and quietness, allowing to gather all together around the same living room and dining table. The kitchen is equipped with every possible amenity. Great rental. 5 rooms and 4 bathrooms 2 kitchens. Great for family or group of friends rental. Great location. The Truly Venice representative was very helpful : he met us at water taxi stop and helped with luggage. He also gave thorough review of area on map and great restaurant recommendations. We had an amazing time! We were thrilled both with the Leone Premium apartment and its location - the staff were very friendly and accommodating too. We had the combined apartments - which was ideal for our family of 8. Beautiful decor and very clean. Loved the little balcony overlooking a canal. Very romantic. Would highly recommend. Il s'agit de deux appartements très élégants avec un accès privé. L'accueil de Truly Venice est charmant et efficace, les commerces sont à proximité et la situation est centrale. A recommander !